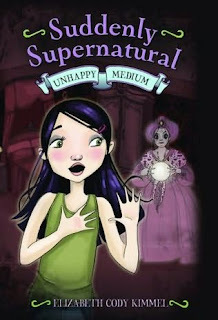 In this third book in the Suddenly Supernatural series, teenage medium Kat goes to a young musicians' conference with her best friend Jac and Jac's mother. The conference is at an elegant lakeside hotel called the Whispering Pines Mountain House. Jac is excited because she thinks Kat might see some ghosts there, since the hotel is so old - and it turns out she is right, because the moment Kat gets out of the car, she sees the ghost of an elderly woman in Victorian-era clothing saunter past them. Kat had been looking forward to spending time with her best friend, and she is also secretly delighted that Jac is considering playing the cello again, as Jac has been ambivalent about her talent. Kat is understanding and supportive when Jac renews her friendship with an incredibly good looking fellow musician, and doesn't really mind when Jac keeps going off to spend time with him. But then a misunderstanding between Kat and her best friend turns into an out-and-out fight, leaving Kat feeling alone and frightened when a powerful, malignant spirit in the hotel targets Kat, and she doesn't know how to fight it. I continue to enjoy this series - Kat is a likable heroine, and she grows and changes from book to book, as do her relationships with her friends and family. I was pleased to see Jac's mother transform from a stereotypical ambitious and controlling mother to a real person, with complexity and - gasp! - a few positive characteristics. It was fun to see Kat and Jac interacting in a new setting, with new issues, and I enjoyed meeting the ghost of Madame Serena and getting a glimpse into the world of spiritualism as it existed in her time. This series is definitely a keeper, and I'll be anxiously awaiting the further supernatural - and mundane - adventures of Kat and Jac. Here is a fascinating interview with Elizabeth Cody Kimmmel, over at Cat's Beyond Books blog. Beyond Books: "I can assure you that I was not let down one bit with this third instalment of Kat’s supernatural adventures." Ms. Yingling Reads: "I love Kimmel's work, especially Lily B. She has a knack with creating real, interesting characters with whom I want to spend a lot of time." Ahh! My review of this book has been done since April, but I was waiting to post it until my 5 Questions interview was done with the author - only life interfered with both of us and we're STILL trying to get that finished (in fact we had yet another email exchange just yesterday!) It'll be up soon though. Darn you beating me too it. hahaha!! Here's an inside scoop - it was sent to the publisher at the beginning of June - so I am hoping this fall? She was still writing it when we started all of this, which is why there was a delay! I love this series! They are such fun. Tanya - I'm glad you enjoy the series, too! Cat - thanks for the heads up! I'm soooo far behind in my blog reader at this point, so it might have taken me a few days to find it. I'm off to check out your review and interview!